Wind between 12 and 20 knots on Saturday and 14-16 knots on Sunday, combined with sunny temperatures well above 20 degrees until the late evening provided the optimal frame conditions for excellent foiling in 7 races and then a cool well deserved after sail beer and pizza fresh from the oven. The latter, for the first time in this end of season event, while sitting outside and enjoying the warm breeze in middle of October on the Baltic Sea coast! On the water there was a tough competition for the lead between Alex, Lars and Thomas. Often they took big gains due to an outstanding downwind performance and stable flights. 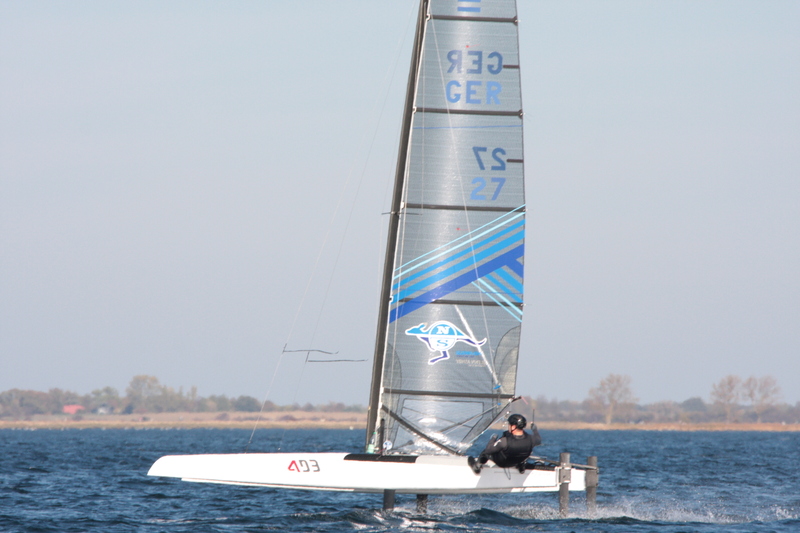 Also practising upwind foiling with sometimes some gains, but no regrets. Eventually it took the last race to decide the regatta, Alex won the last race and therefore the regatta, while even on points with Lars. Thomas was also just a glimpse behind. Thereafter Peter won the runner-up title battling with Guido, Jörn, Jarek and Alexander, which was also the sequence at the end. The first classic was Thomas Becker on his Flyer S in 9th place. Then on ten our former German class president Christian Steinmetz, whom we have not seen on a race course for ages. We hope to have you back for good Christian! We also hope that at some point we will as well see a return of long-time A-class sailor Peter Rübener, who announced that this was his farewell A-class regatta. All in all a great event with 19 competitors from Germany, Poland and Denmark. Warm thanks to everybody for coming to Wismar again and to all helpers, supporters, sponsors and friends.